Regarded as the one of the best players to have ever played, Pele has represented his Country on the biggest stage at the biggest event in the World. Pele has succeeded on the World Stage in guiding Brazil to World Cup Glory in 1958, 1962 and 1970. For the first and only time Pele has signed this item with his full signature ” Edson Pele ” making the shirt extremely rare and astute investment. The Shirt is issued with a Certificate Of Authenticity along with photo of Pele signing. The Shirts were signed on the 6th March 2006 in South Africa. 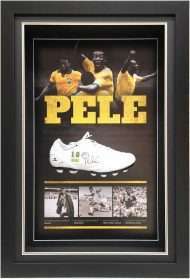 Personally signed by Edson Pele – Features his full signature. Features a Replica 1970 Brazil World Cup Shirt. Accompanied by a Certificate of Authenticity with photo of signing. Approximate framed dimensions –1100mm x 950mm.